On Friday, I was craving Pei Wei lettuce wraps! So after work we went with Kelli and it was delicious! But not so good for leftovers, lemme tell ya! 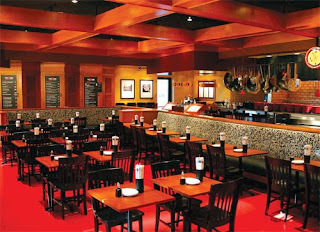 It's kind of like a fancier version of Panda Express, but cheaper than P.F Changs. After dinner, we walked over to Whole Foods. I had heard a lot about it and we were curious about what the big deal was. Personally, I thought it smelled disgusting in there. Way too many different smells going on in one place. But, I could see how someone would like going there is they were into the whole "natural" foods things. They even had like, natural clothes and makeup and stuff. Eh, not really my thing. I'm careful enough with my fruits and vegetables. They have so many different flavors of wings. My favorites are Honey BBQ and Asian Zing, but another popular one is Garlic Parmesan. They really liked it, and it was so much fun! I love introducing it to new people. After lunch, we went to the movies to see if there was anything good out but I refuse to watch Alice in Wonderland (it creeps me out) and there wasn't really anything else that we would want to pay to see in theatre so we ended up going to Golden Spoon (their first time- again!) 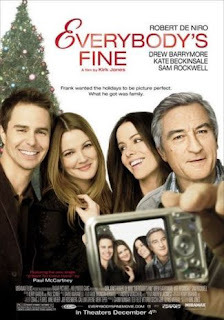 and renting "Everybody's Fine" and watched it at our place. It was a really good movie and I definitely recommend it. Then we dropped them off and went to return the movie (it was a redbox movie) and we were already close by his parents house so we stopped by. They had just started a movie so we sat down to watch it with them. (Can you say lazy Saturday? Sheesh!) It was one of the worst movies I have ever seen. DON'T watch this movie. It was a huge waste of time. Although, we all got a good laugh in so I guess that was good. Then we went over to my parents house (luckily we all live within 15 minutes of each other) and just hung out and talked with them for a while. On Sunday, we taught the Sunbeams for the first time together. We just got called to be the Sunbeam teachers! If you don't know, Sunbeams are just 3 and 4 year olds in our church. They are so cute! It was exhausting but totally worth it. Well, that was my weekend! It was pretty eventful, which I love because I feel like I have NO social life all week because I work so much and so far away from home. sounds WAY fun, I'm jealous! jk :) I was the sunbeam teacher for a few months, it was a crazy experience. At least you get to be with your hubby though, that's nice. Mmmmmm. I love Pei Wei. 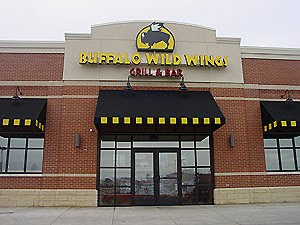 And the hubs is a HUGE fan of BWW! my boyfriend & I LOVE buffalo wild wings... they opened a new one up about 3mins from us back in the fall and we went almost everyday.